This concert took place January 22, 1967, at a sold-out Lincoln Center in New York City. 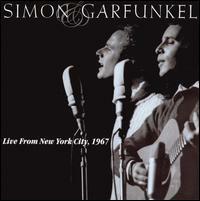 Simon and Garfunkel also performed "Red Rubber Ball" at this concert, as evidenced by its presence on Old Friends, but, for whatever reason, it was not included in this collection. Released on Wednesday Morning, 3 a.m.
Mississippi's gonna be your buryin' place"
Art: Wow. Carnegie Hall. (laughter) I am Artie Garfunkel, at least, alias Artie Garfunkel, now Arthur Garfunkel. This is Paul Simon on my left, and this is "Leaves That Are Green." Paul: Relative to nothing, this is a song called "Sparrow." Released as the B side of "Fakin' It"; this is an earlier version of the song. Paul: Here's a song I almost finished. Paul: I wrote this song when I was living in England, and the seeds of the song were planted one day when I saw an article in a London paper about a man who had committed suicide, you see. Four lines in the paper. And I thought, "That's a very bad way to go out. Bad eulogy. Four lines." It's called "A Most Peculiar Man." Paul: This is called "Feelin' Groovy." Art: This is the song that took the longest of all the songs to write and to record, and it's also about our favorite amongst all the songs. It's called "The Dangling Conversation." Richard Cory (3:23) Read the poem on which this song was based! Released on Sounds Of Silence. Art: There's a song that comes out of, ah, the second album, the Sounds Of Silence album, which is an adaptation of an Edwin Arlington Robinson poem, written many years ago, and studied by myself in junior high school. The poem is called "Richard Cory." 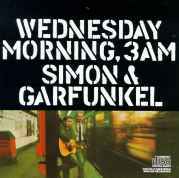 Art: The, uh, first album that we recorded for Columbia, called Wednesday Morning, 3 a.m., has a picture on the cover of Paul and myself in the subway system in New York here, standing at the, um, Fifth Avenue station, next to an iron post; if you know the album and you're familiar with the picture, what you're not familiar with is the trouble that we went through in order to get that final picture, because the original shots that were taken for the, uh, cover were taken off, off the, uh, picture that you see, standing against the subway wall on the platform, underneath the subway sign. And we took about five hundred pictures until we were satisfied with the perfect James Dean shot, and packed up the cameras and guitars, and as we left the station, I took a glance at the subway wall in front of which we had taken all the pictures for the first time that day, and noticed that written there, rather legibly, in the baroque style common to New York subway wall writers, was, uh, was the old familiar suggestion. And rather beautifully illustrated as well. So. Well, we had a conference with Columbia Records to decide what to do about this problem, and um, of course, we immediately told Columbia that this was exactly what we wanted on the cover of the LP. Forget it. I'm, um, mentioning this because we have taken a song, it's now two years later, Paul has written a song fairly recently, in London, dealing with the, uh, theme of people who write on subway walls, but treating the theme in a rather strange and serious way. The song is called "A Poem On The Underground Wall." Paul: (amid audience shouting) Just a little kid, you cannot yell like that at me. "Hey, Schoolgirl!" Who said that? Saying, "I won't be a slave anymore"
Paul (in a bemused British accent, amid continuing shouts of "More!" from the audience): Shut up, you've had your fun. (laughter, chattering, guitar chords, pause) Thought I was playing alone there for a little while. Oh what have I done, why have I done it?